Unit Width: 24", 30", 36", 42" & 48"
Contact us for assistance with the many available customization options. The versatile ThinStak® Letter Open Shelf Filing System from Datum Storage helps keep your medical documents organized and accessible while taking up a minimal amount of floor space. This model has 8 tiers. Space Saver: When compared to lateral filing cabinets, this model stores more than 50% additional files while taking up 27% less floor space. It consists of individual stackable shelf tiers with fixed or movable dividers on each tier, creating a complete shelving unit. Its configurable design allows you to add additional tiers for more storage space. It is incredibly durable and sturdy, manufactured from rust-free cold rolled steel without any sharp edges. The tiers are welded together using the latest manufacturing technologies for a true state-of-the-art, dependable shelving unit. Specifications: The tiers with movable plate dividers are 11" high with a 10 7/8'" inside clear opening and with the fixed dividers are 10" high with a 9 7/8" inside clear opening. The overall height for the unit with the movable plate dividers is 91" and for the one with fixed dividers is 83". The depth of the unit is 13-3/16" and the overall width is customizable. The powder coat finish is an environmentally friendly, attractive, uniform finish that is scratch and corrosion resistant. Each customizable model has a different amount of LFI (Explained below). TrakSlider: The ThinStak can easily be upgraded to the TrakSlider™ System which is a movable file storage system that provides you with more storage space as you need it while eliminating aisles between shelves for increased efficiency. The ThinStak Letter Filing Unit comes with several customizable options in order to provide you with the perfect product that fits your specific needs. Select your preferences from the drop-down menus above. You can choose from the following overall widths for your shelving unit. There are two types of shelf dividers to choose from - Movable Plate and Fixed. 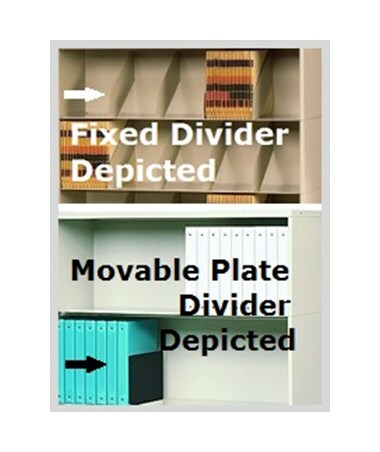 The Movable divider can be moved to the right or left as needed while the fixed divider is a solid piece that stays in place. Choose your customizable preferences from the drop-down menus above. Prepunched tops and bases ensure easy installation to Datum’s TrakSlider mobile system without drilling. 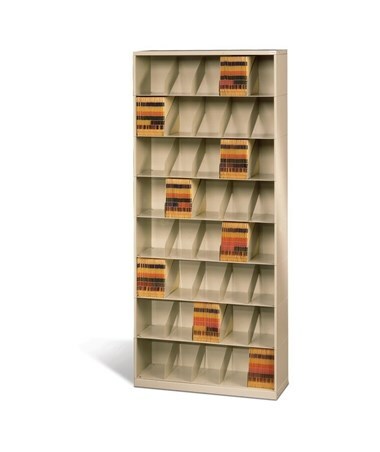 Fixed or adjustable dividers provide ultimate customization and organization. 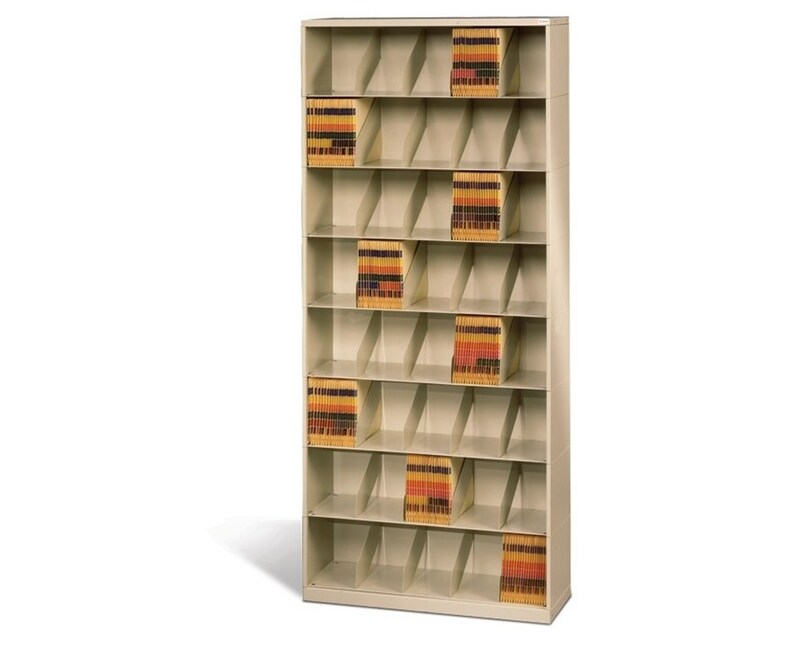 Optional posting shelf provides additional workspace and saves space by retracting when not in use. Compact shelving profile increased storage space and efficiency. Width(s) 24", 30", 36", 42", 48"
Product Weight 110 - 209 lbs. Datum Filing Systems warrants to the original purchaser for the life of the product so long as original purchaser is the owner and possessor of the product that the product will be free of any defect in materials or workmanship. Datum Filing Systems will provide, for a period of two years from the date of shipment, free of charge, all labor at the location of the product to repair or replace any part of the product that fails because of such defect. After two years from date of shipment, labor will not be provided. All parts will be provided for the life of the product so long as all requirements are met as set forth in this warranty. This warranty does not include defects to the product resulting from accident, misuse, improper installation or operation, normal wear, neglect, unauthorized repair or alteration. The purchase of this product shall constitute purchaser’s agreement that the sole remedy for any breach of warranty shall be such repair or replacement as expressly provided above. Datum Filing Systems in no event shall be liable for any incidental or consequential damages arising out of the use or inability to use the product for any purpose whatsoever. **Lifetime Warranty excludes all tambour doors and all electrical components, which carry a 2 year warranty.